So Ruth went and gathered grain in the fields behind the harvesters. Ruth, knowing that they needed food, went to the field and picked up what she could for her and Naomi. She was willing to pick up only what was left behind. She did not care for her pride, but for a few leftovers on the field that would be sufficient to feed themselves. What a great attitude to have. Instead of whining about going hungry, she did something about it without having to ask for a lending hand. She knew that she must do something about her situation and act upon it. If only we could have that attitude about all we do in life. 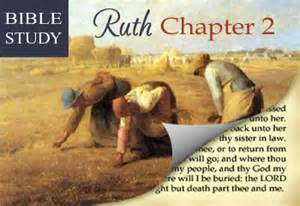 We could humble ourselves like Ruth did, and God will provide rewards for our good actions. Oh! Lord, give us a sense of humbleness in our daily endeavors. Remind us that you see all we do and know when to award your just rewards. Thank you for all the leftovers in life that become a way to an abundant life. If only we could accept our place on Earth, we shall be exalted in Heaven. Categories: devotions, god, verse of the day | Tags: Boaz, Book of Ruth, God, Israelites, Jesus, Lord, Moab, Prayer for the Day | Permalink.